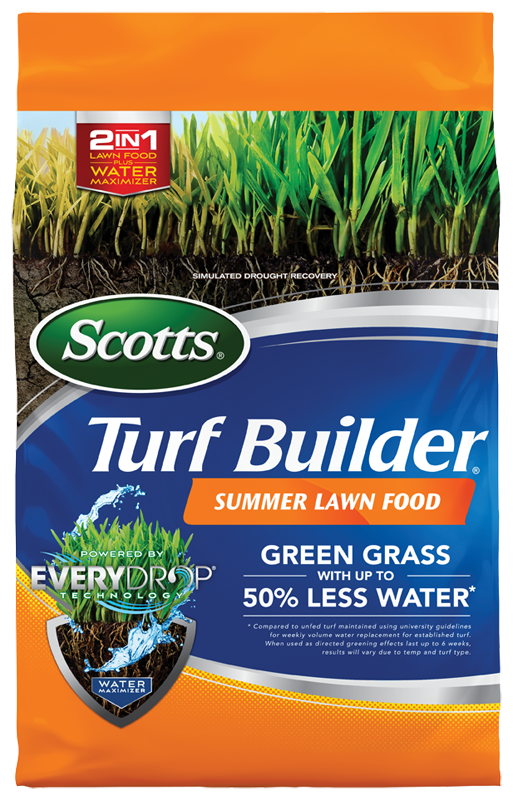 Scotts® Turf Builder® Summer Lawn Food greens grass with up to 50% less water. * It is powered by EveryDrop® technology which helps drive water into hard dry soil. Plus, it feeds to build strong, deep roots. *When Used as directed, greening effects last up to 6 weeks, results will vary due to temperature and turfgrass type. Apply to actively growing turf. Safe on all grass types. Apply to a dry lawn. For best results use a Scotts® spreader. Do not apply near water, storm drains or drainage ditches. Apply in summer when turf is actively growing. EveryDrop® is a unique formula of wetting agents designed to help move water into the soil, consistently and evenly. This helps reduce wasteful runoff and pooling. Whether relying on rain, sprinklers or hoses, EveryDrop® helps make the most of available water. As much as possible take advantage of nature's sprinkler and rely on the rain to water your lawn. Apply this product only to your lawn and sweep any product that lands in the driveway, sidewalk or street back onto your lawn. Scotts No-Quibble Guarantee®: If for any reason you, the consumer, are not satisfied after using this product, you are entitled to get your money back. Simply send us evidence of purchase and we will mail you a refund check promptly. Keep out of reach of children. Eye contact with contents may cause irritation. Flush eyes with water as soon as possible after contact. Keep away from kids and pets. Do not allow people or pets to enter treatment areas until watering-in is complete and the surface is dry. Water to activate after application. Scotts® Turf Builder® Summer Lawn Food greens grass with up to 50% less water (when used as directed, greening effects last up to 6 weeks. Results will vary due to temperature and turfgrass type). It's powered by EveryDrop® Technology which helps to drive water into hard dry soil. Plus, it feeds to build strong, deep roots. To save water, try reducing watering time while maintaining lawn color. For Example, if you normally water for 30 minutes, try 20 minutes. If your lawn still looks healthy, try watering for 15 minutes.